The Lyra is within close proximity of central London and all of its leading universities, giving you easy access to shops, galleries, restaurants and nightlife. Situated in zone 2 on the Central Line, next door to North Acton station and the local bus service. 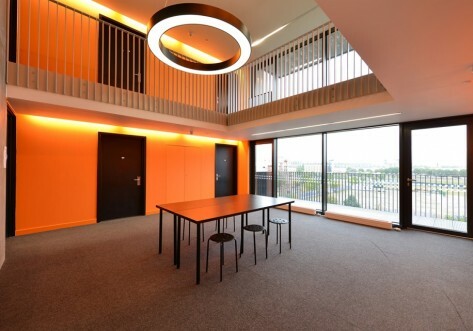 Next door to North Acton tube station on the Central Line, The Lyra is only 20 minutes from bed to Oxford Circus! Bronze studios have an average floor space and include stylish fitted furniture, spacious kitchen and modern bath or shower room. 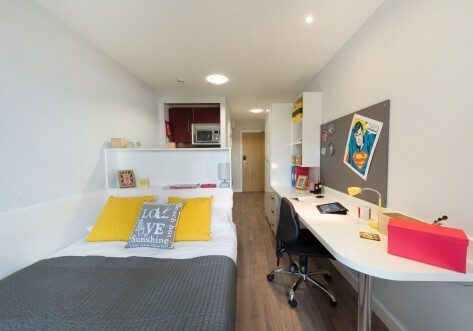 Within the studio there’s a large bed, Smart TV and ample storage space. Essentials like a fridge/freezer, microwave, toaster and kettle are supplied; just bring your own bedding, towels and utensils. Available from 11th January 2019. Boasting on average a floor plan, the studio includes modern fitted furniture, a large bed and Smart TV. The kitchen space has essentials like a fridge/freezer, microwave and kettle, with an iron, ironing board and vacuum also available. Just add your own utensils, as well as bedding and towels to the stylish bath or shower room. Available for double occupancy. Enjoy quality fitted furniture within the studio, as well as a modern kitchen and stylish bath or shower room. 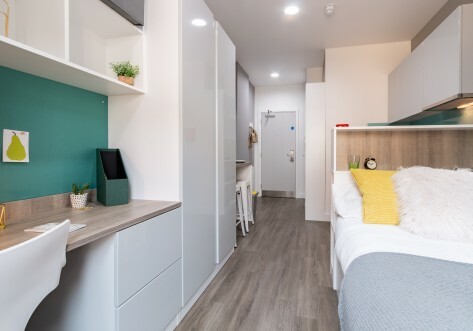 Essentials such as a Smart TV, fridge/freezer, microwave, toaster and kettle are included, so just add your choice of towels, utensils for the kitchen and bedding for the large comfy bed. Expect an average floor space of 26m2. 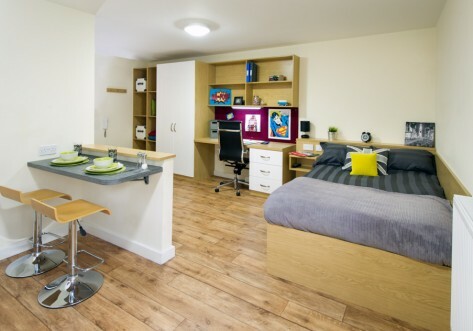 Enjoy an average floor size of , offering ample storage and study space thanks to the stylish fitted furniture. The modern kitchen and bath or shower room include essentials such as a fridge/freezer and microwave. Simply add a personal touch with your own bedding, towels and utensils, then relax on the large bed and watch the Smart TV.